Response: Increased breast tissue density is a common finding at screening mammography. Approximately 30-50% of women have so-called “dense breasts” but many of them are not aware of it. The problem is that the increased tissue density can potentially mask early cancers. In other words, if there is cancer hiding in dense breast tissue, it could be difficult to spot it. To improve the awareness of breast tissue density, a patient group called Are You Dense Advocacy, Inc., started lobbying state and federal policymakers to pass laws mandating health care providers to notify women about their breast density assessments. As a result, 31 states have already enacted some form of legislation regarding dense breast tissue. 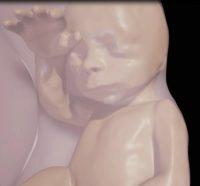 Response: A growing number of technological advancements in obtaining and viewing images through noninvasive techniques have brought major breakthroughs in fetal medicine. In general, two main technologies are used to obtain images within the uterus during pregnancy i.e. ultrasound (US) and magnetic resonance imaging (MRI). Dr. Timmerman: Ovarian cancer is the most aggressive and lethal gynecological malignant neoplasm. The prognosis of ovarian cancer is poor, with only about 40% of patients still alive five years after being diagnosed. The preoperative characterization of an adnexal tumor is fundamental for selecting the optimal management strategy. An accurate differentiation between benign and malignant masses can lead to optimal referral of patients with malignant diseases to gynecological oncology centers for further diagnostics and treatment, which positively influences the prognosis. On the other hand, it may help in safely selecting patients with benign ovarian masses for minimally invasive or fertility sparing surgery, and in some cases maybe even conservative follow-up. The International Ovarian Tumor Analysis (IOTA) study is the largest diagnostic accuracy study of its kind. Transvaginal ultrasound is a cheap and very accessible imaging technique. Using ultrasound features, which are easy to assess by a trained examiner, we proposed a model to define the individual risk of malignancy for each patient presenting with an adnexal tumor. This could considerably impact on the morbidity and mortality associated with adnexal pathology. Response: The safety of withholding anticoagulation only on the basis of ultrasound imaging has not been evaluated in patients with suspected (Upper Extremity Deep Vein Thromobsis) UEDVT. The purpose of this management study was to evaluate the failure rate of ultrasound testing for UEDVT diagnosis in outpatients. Our data show that, similarly to the lower extremity, a negative complete ultrasound assessment of the upper extremity can safely exclude DVT. We found a 3-month VTE rate of 0.6% after a negative ultrasound and such figure is not different from the 3-month VTE incidence in management studies for lower limb DVT. Thus anticoagulant therapy can be withheld for clinically suspected UEDVT after negative ultrasound examination without further testing in the ambulatory office setting. Epidemiology and Biostatistics; and Obstetrics, Gynecology and Reproductive Medicine UCSF San Francisco Calif.
Dr. Smith-Bindman: New technology is rapidly developed in medicine, and its important to understand how that technology should be used to improve patient health outcomes. Sometimes the technology is far better than existing technology and it should replace the earlier technology, and sometimes it is not and therefore should not be used. In this clinical scenario – I e. patients who present to an emergency department with abdomen or back pain thought to possibly reflect kidney stones, ultrasound is a simpler, less expensive , and more readily available test in the emergency department setting and therefore if it is equal to CT with respect to patient outcomes, it should be used as the first test in these patients. Currently, CT is the test widely used for patients with suspected kidney stones. We assessed a large number of patients with suspected kidney stones seen at one of 15 large academic emergency medicine departments across the country. Patients were assigned to point of care ultrasound performed by an ED physician, radiology ultrasound or radiology CT. We assessed a broad range of patient centered outcomes and found each of the three tests we studied were equivalent in terms of these outcomes including complications related to missed diagnoses, related serious adverse events, time spent in the emergency department and repeated ED visits and hospitalizations. However, the exposure to ionizing radiation was around half as high in patients who underwent ultrasound as their first test, and thus ultrasound should be used as the first imaging test in patients with suspected nephrolithiasis. How Well Do Fetal Ultrasound Measurement Predict Infant and Childhood Outcomes? Dr. Turner: There is evidence that being small for a given gestational age is associated with a broad range of what could be loosely considered “disadvantageous” outcomes in early childhood, eg increased risk for wheeze, increased blood fat levels, increased blood pressure and low bone mineral density. Many of these outcomes are subclinical – ie unless they were measured no-one would be any the wiser – and what remains to be determined is whether as these individuals grow up these subclinical measurements become important. Follow up may take many years, decades for outcomes such as coronary artery disease and type II diabetes.